Honey Roasted Butternut Squash with Goat Cheese . Recipe. If you can’t find Honey Goat Cheese in your grocery store or gourmet market, try Trader Joes, they usually have some. 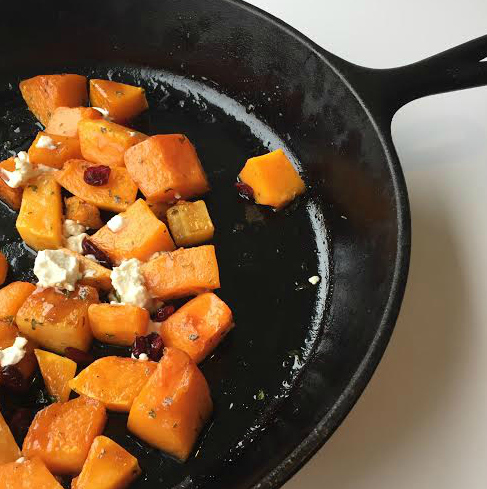 In a cast iron skillet, place the chunks of butternut squash, drizzle with the herbed olive oil, salt & pepper. Roast at 400 degrees 15-20 minutes or until fork tender. Remove and toss in the crumbled goat cheese, drizzle with the vinegar and honey. You can add some cranberries if you like or even pecans would be a good compliment! Serve hot or cold. You may use the leftovers in the hot quinoa cereal the next morning with a little extra goat cheese, cranberries and honey…amazing!! !